That at-bat was not the one that stood out from the recent look, however; rather it was one that ended with a line-drive single to right field. What was especially noteworthy was the professional quality at-bat put together by Brentz. After taking a first-pitch slider, fouling off a couple pitches and taking another, Brentz found himself in a 2-2 count. He got a slider down and away, a pitch in one of his weak spots, but Brentz shortened up and punched the ball through the right side. He picked up the pitch early, kept his weight back, and then went with the pitch, taking what the pitcher gave him rather than selling out for power and trying to pull the ball. At-bats like the one described above, however, are not the norm and as a result, even with his power potential, the odds of Brentz actually reaching his ceiling at the plate are low. Brentz does not track the ball well and when he takes a strike, it seems to be just for the sake of it rather than as a result of being up there with a plan. He still really struggles recognizing off-speed pitches, often caught out on his front side against those offerings, resulting in a weak ground out or swing and miss. Furthermore, Brentz falls behind in the count far too often. Due to his lack of plate discipline, he rarely finds himself in a good count where he can sit dead red on a fastball. Even with all that said, Brentz still has potential value at the big league level due to his power. That’s likely in a bench role as a platoon bat, where his weaknesses could be masked, but if he ever improves his approach there is still a chance, albeit slight, for more than that. 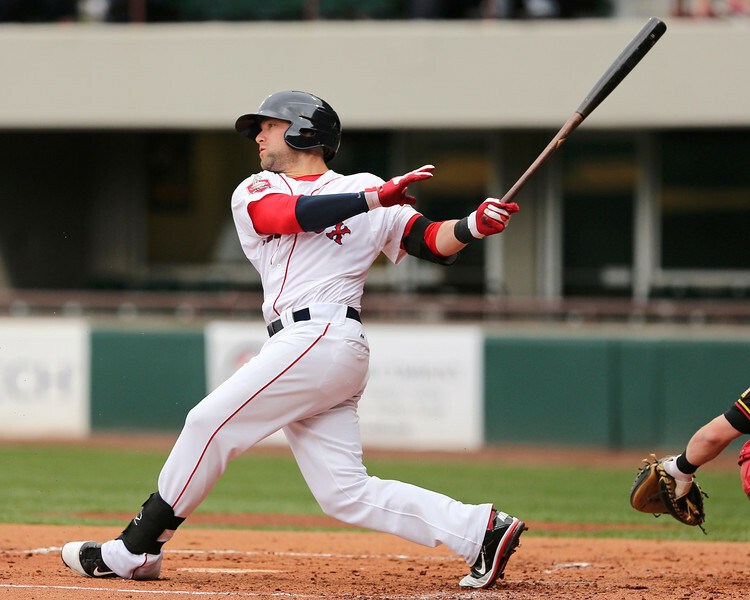 - Shortstop Deven Marrero’s calling card is his glove, but during a recent look his defense was very inconsistent. 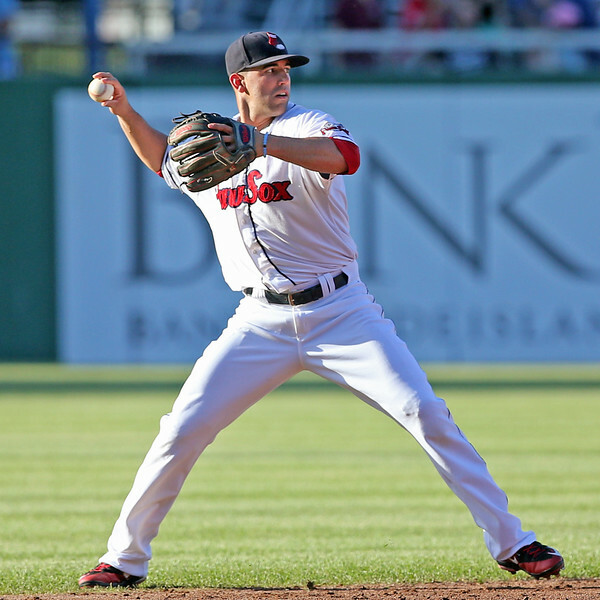 At his best, Marrero shows off a plus arm and plus-to-better glove, making even difficult plays look easy. Over the course of the look, Marrero had several plays when he was lackadaisical and seemed to lose focus. This was most evident during a single inning when Marrero made back-to-back errors on throws. Both times he fielded the ball fine, but on the first he was very nonchalant and slow to throw it, allowing the runner to reach. The next batter hit a line drive to Marrero on which he made the play, but then attempted an ill-advised throw, which did not need to be made, to try to double the runner off that ended up getting past the first baseman. 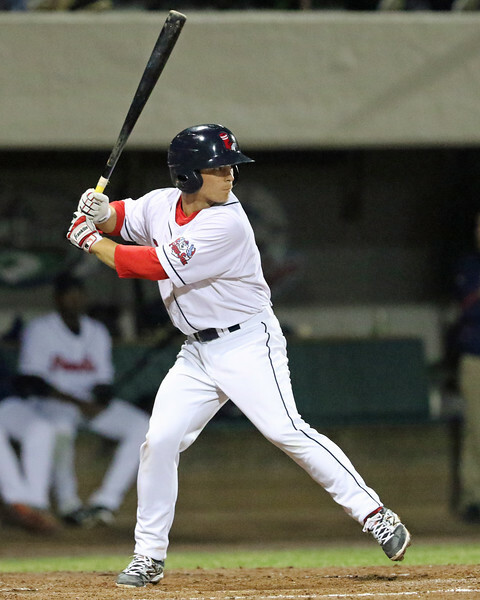 The errors extended the inning by five batters and cost Pawtucket four runs. Marrero also made another fielding mistake in the game that was ruled an infield single. These are the kind of mistakes that Marrero cannot afford to make as a glove-first shortstop, especially when he is unlikely to add much value at the plate. At the plate, even though Marrero got four hits, there were some troubling signs. Most notably, Marrero’s timing was off and his front side was consistently flying open early after his load, with his front foot landing open towards third base. As a result, he was constantly pulling off the ball and having a lot of trouble covering pitches away. Marrero has trouble recognizing spin and has the tendency to cheat a bit on fastballs inside, making him especially susceptible to breaking balls down and away. This was on display during this look as he struck out twice on sliders down and away in one game and had very little success against the pitch overall. On one occasion, after swinging and missing on a breaking ball down and away, he did make an adjustment, staying back and dropping the barrel on the same pitch the next offering, grounding it through the right side for a single. Marrero was able to make a solid contact a few times, especially on a fastball up that he was able to get extended on a line to center for a double. Overall, the offensive bar at shortstop is very low these days, and even if Marrero is a below-average hitter with well below-average power, he has the glove to carry him to a second division profile. Offensively though, there is not much upside on top of that for him, as he does not have a swing or physique that lends itself to project him to add power as he matures. There is not much projection left with his hit tool either mainly due to him having too much swing-and-miss in his game and poor pitch recognition. - In another season in which he has missed time due to injury, this time 26 days due to left elbow inflammation, Sean Coyle still is flashing a few intriguing tools, but because of his approach and the swing-and-miss in his game, it is hard to project him as more than an up-and-down, utility player type. Though undersized at a listed 5-foot-8, 175 pounds, Coyle has a very long swing, rarely getting cheated at the plate. As a result, he has surprising power for his size, but also has issues making contact. This was on display during a recent look, with Coyle striking out three times in one game, but also showing his pop when he can get extended on pitches out and over the plate. Two strikeouts came on fastballs that he was beaten on and swung through, not shortening up with two strikes, and the third looking when he was frozen on a fastball after a couple of breaking balls. Coyle’s strikeout totals are not as high as others in the system, but save for last year in Portland, his strikeout percentage has been rising as he has progressed to a current career high of 32.2 percent. With his profile, that is too high, and if he continues like this, his power will not actualize as he won’t have the hit tool for it. Though Coyle has some questions with the bat, he has potential to add value on the base paths and in the field. Coyle does not have standout speed, grading out as solid-average, but he makes up for that with excellent baserunning instincts. Over his last four seasons, he is 45 for 50 in stolen bases, and though he likely will not put up huge stolen base totals he can add value there. Similarly, Coyle’s defensive versatility will serve him well. Coyle is a solid athlete and has a plus arm, soft hands, and fluid actions. He has shown the ability to play a solid second base and third base, and could even develop into a passable outfielder, having played three games there this year. Development of Coyle’s hit tool will ultimately determine his future value, as the other facets of his game have big league potential, but now in his sixth season with the organization the odds of significant improvement in that area are not very high.